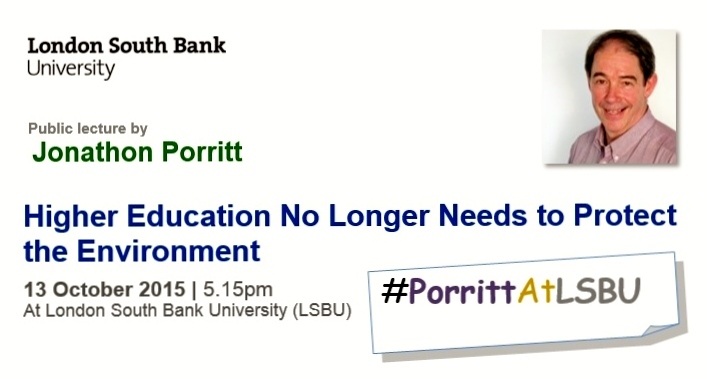 A public lecture titled ‘Higher Education No Longer Needs to Protect the Environment’ by internationally-renowned environmentalist Jonathon Porritt CBE will take place at London South Bank University (LSBU) on 13 October 2015 from 17:15 to 19:30. At this event hosted by LSBU, Jonathon Porritt will discuss the future of sustainability in higher education, and what it means to the higher education community. The lecture will be followed by a question time and a networking session with refreshments. The event is open to all and free to attend but prior registration is required. Jonathon Porritt is Co-Founder of Forum for the Future, former Chairman of the UK Sustainable Development Commission and Chancellor of Keele University. 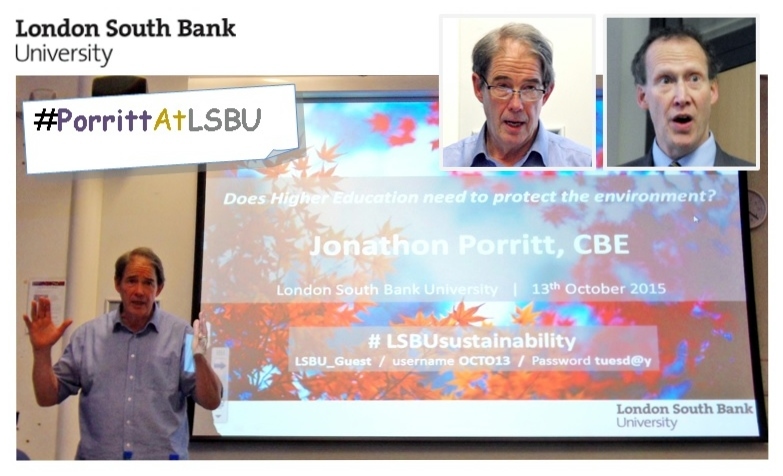 Notes: LSBU logo is from LSBU website and the photograph of Jonathon Porritt is from Forum for the Future website. 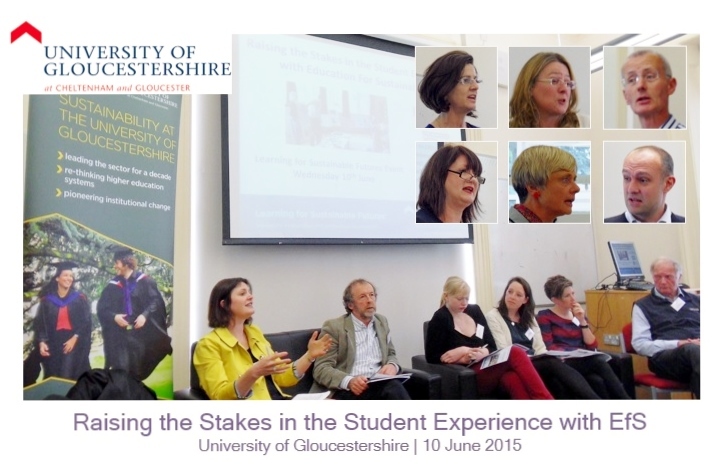 The University of Gloucestershire (UoG) held its annual Education for Sustainability (EfS) event on 10 June 2015. Titled ‘Raising the Stakes in the Student Experience with EfS’, the event took place as part of the university’s Festivals Fortnight. 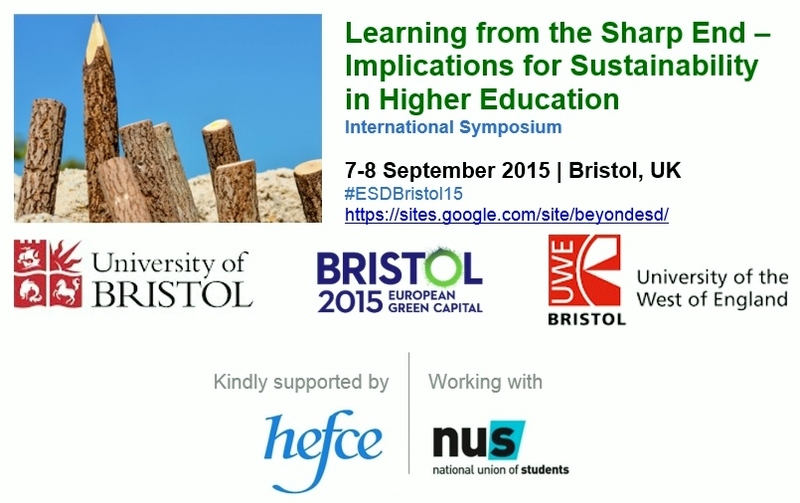 This annual event series is the flagship of the university’s Learning for Sustainable Futures Scheme (LSFS). Launched in 2012 as part of the university’s approach to enhancing the quality of learning and teaching across all subject areas, the LSFS is a collaborative initiative between the university’s Sustainability Team and the Academic Development Unit. Through an annual call for project proposals, this scheme provides staff with grants to lead and develop new projects to embed EfS approaches into the curriculum and student learning experiences. The day started with a welcome by Maureen McLaughlin (Dean of Quality and Standards, UoG). In her address, titled ‘Promising Futures: 7 Years of Innovation and Change at UoG’, Professor Daniella Tilbury (Dean of Sustainability, UoG) noted that the EfS agenda is moving in the right direction, slowly but steadily and there are many opportunities for EfS action than ever before. She said that the culture of EfS has been embedded in different part of the university in different ways and a learning process is taking place. Although there is much to celebrate, there remains a lot more to be done, she noted. Speaking on ‘Sustainability and the Student Experience’, Jamie Agombar (Head of Sustainability, National Union of Students NUS) revealed that the fifth HEA-NUS survey on students’ attitude towards sustainable development (which is yet to be published) is indicative of the same positive trend of students preferring sustainability to be embedded in their courses. He also outlined the work of Students Green Fund and Responsible Futures. The session on welcome and introductions ended with outlining of the event themes by Dr Alex Ryan (Associate Director of Sustainability, UoG) and Professor Sharon Turnbull (Leadership Trust), master of the ceremony. The programme comprised three main sessions. In two of them, the leaders of the LSFS projects shared their work in areas such as Accountancy, Fine Art, Business, Fashion, Product Design, Sports Placements, Tourism and Libraries. In the third main session, a panel comprising guests from three other universities and UoG Student Union’s Greener Gloucestershire team (see main photograph) shared new ideas and initiatives on engaging students in sustainability. At its end, Professor Stephen Marston (Vice-Chancellor UoG) remarked on student sustainability journeys at UoG. The day’s programme came to an end with a discussion group session on Graduates’ Future Horizons. The workshop was Professor Tilbury’s last EfS event at UoG before leaving the university at the end of June, to take up the post of vice chancellor at the newly established University of Gibraltar in September 2015. Photographs by Asitha Jayawardena. Logo is from the University of Gloucestershire website. 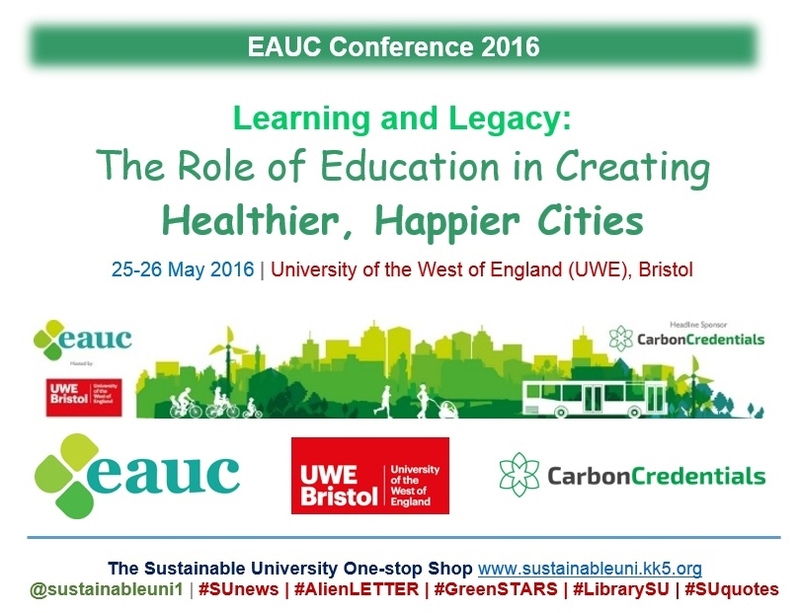 The annual Education for Sustainability (EfS) event of the University of Gloucestershire (UoG) will be held at the University’s Park Campus on 10 June 2015. This year’s event, titled ‘Raising the Stakes in the Student Experience with EfS’, is focusing on student experience as part of Festivals Fortnight. At this event, the leaders of the LSFS projects will share their work in areas such as Accountancy, Fine Art, Business, Fashion, Product Design, Sports Placements, Tourism and Libraries. Moreover, in an interactive panel discussion, guests from three other universities (Plymouth University, University of East Anglia and University of Wales Trinity St David) will join the UoG Student Union’s Greener Gloucestershire team to share new ideas and initiatives on engaging students in sustainability. The graphic is adapted from the event programme.